The Ole Miss Women’s Tennis team is proving to be a force in the SEC. The Rebels were 3-3 going into SEC play, beating Alcorn State twice and Tulane once, but lost tough matches to top teams, including No. 9 Michigan and No. 21 UCF. The Rebels are gaining momentum and now sit at 6-5 overall and 3-2 in the SEC. After dropping their first two SEC matches to Florida and South Carolina, the Rebels are now on a roll. They won their last three SEC matches by beating Mississippi State, Alabama and Auburn. The key to their success has been strong performances from the entire team. 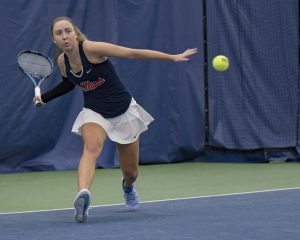 The Rebels have been able to earn points in different ways and have been strong in singles matches, even when they haven’t won the doubles point. First-set wins are also proving to be important to the Rebels. In their match against Mississippi State, every singles player won her first set against the Bulldogs, resulting in four match wins. Ole Miss won five first sets against Auburn to help secure the win. Senior Tea Jandric has been a big part of the team’s success. Jandric has won six consecutive matches, contributing to the Rebel’s win streak. She has moved between the No. 1 and No. 2 singles spot this season and has won all of her matches handily. Her most notable win was over Mississippi State’s Magda Adalogou, the No. 113-ranked player in the country. Sabina Machalova, the Rebels’ No. 1 singles player, had notable wins over Mississippi State’s Emma Antonaki, the No. 81-ranked player in the country, and Auburn’s Jaeda Daniel, the No. 72-ranked player in the country. Tereza Janatova also won her last three SEC matches to contribute to the Rebel’s win streak. The Rebels can count on Janatova’s consistent performance in her singles position this year. Ole Miss is heading to Athens, Georgia, on Friday to face the Division I ITA National Women’s Team Indoor Champion and current No. 1 Georgia Bulldogs. The undefeated Bulldogs are led by their No. 1 singles star, Katarina Jokic, the No. 1 player in the country. Georgia has three players ranked in the top 35 in the country and five in the top 105. Ole Miss beat Georgia twice last year, but the Bulldogs will be their toughest competition yet this season. Ole Miss is looking to carry their momentum into Friday’s match. The match is set for 4 p.m. Friday.